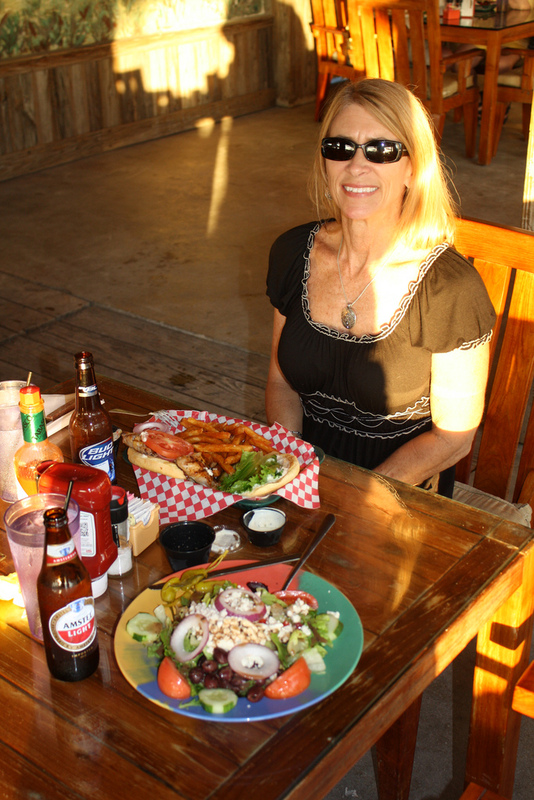 This is our #1 place in the ENTIRE KEYS to eat at and brings friends and relatives when visiting. This place has anything and everything to make for a memorable dinning experience and much MORE! Without exaggerating, you could easily spend 3 hours here including dinner without batting an eye or being bored. On this property alone there’s the oceanfront dining area, market store, tarpon pool to feed live ocean fish, live band, sunset watching area lit with tiki torches, & fiberglass oceanic fish of all kinds hanging from the tiki hut rafters. As an extra bonus, this property connects to the World Wide Sportsman complex mega store and marina where there’s an endless list of tourist attractions. Simply put, 3 hours here may not be enough! 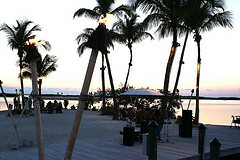 It’s an AMAZING place and therefore our #1 place in the entire Keys for bringing any new visitors! Hmm, come visit for yourself and I bet it becomes your #1 all to do in one place also! Oh yeah, I almost forgot… the food is incredible! 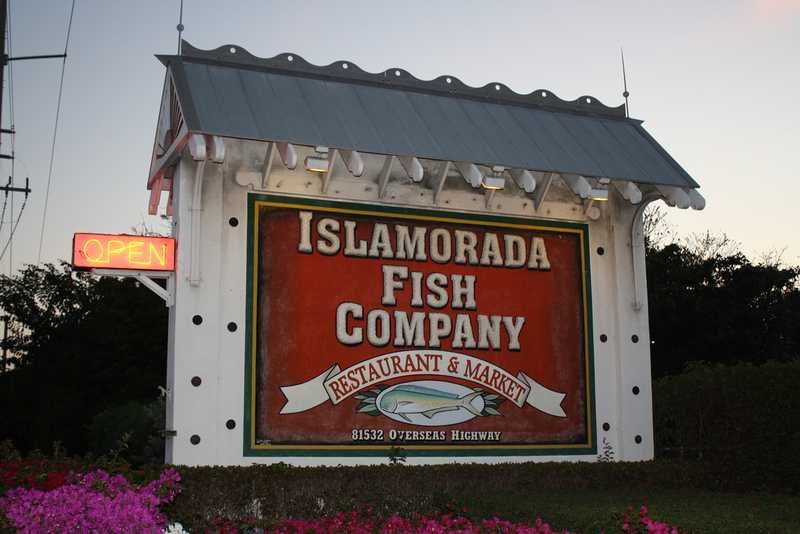 You can find the Islamorada Fish Company’s Relaxing dining area and breathtaking ocean views by traveling on US-1 to Mile Marker 81.4 bayside. While here, be sure to go next door to see the Key’s LARGEST FISH TANK on display also for the amazing price of FREE. Too weird and way too cool! A single lone burial grave site sits only two feet away from this building! I’ve heard wind of this for years but had never ventured from the sidewalk through the plants and bushes to check it out. Thousands of tourists pass this site every day not knowing a thing! Some may think this to be a tad creepy, I on the other hand found it to be amazing that a single solitary grave goes unnoticed and unmarked just eight feet off the sidewalk. Though there’s no headstone or historical marker pointing to it, its occupant’s name is inscribed upon the marble. You can find this lone grave on the corner of Eaton & Simonton Streets. 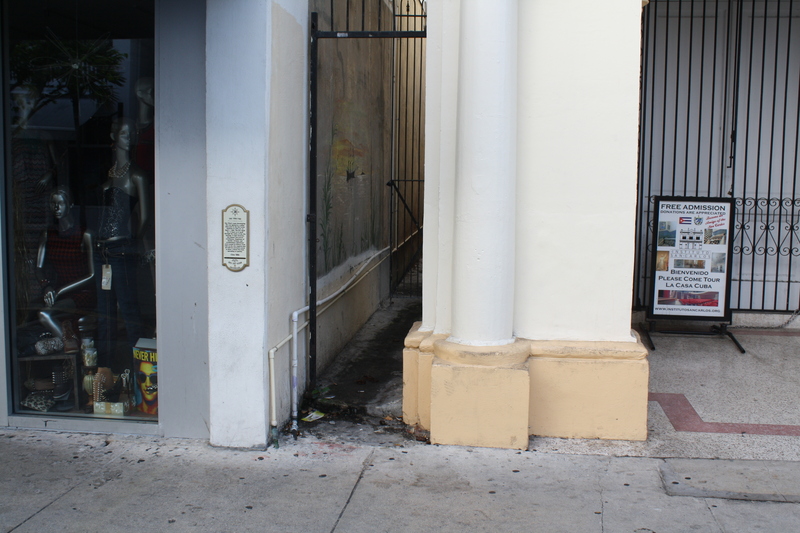 Once at the corner go to the west side of the building on Simonton Street and venture off the sidewalk up towards the building and there you’ll find this lost grave and legendary ‘Ghost Tour’ site. Artwork or what? To some this may be artwork to others it might be junk but to the Re-Cycle Bike Shop it’s just living up to its name recycling what it knows best… bikes. This welded bike pyramid is definitely different, unique & one-of-a-kind. If you have children of any age they are going to enjoy seeing the spoke-filled pyramid of multi-colored former ridden cycles. 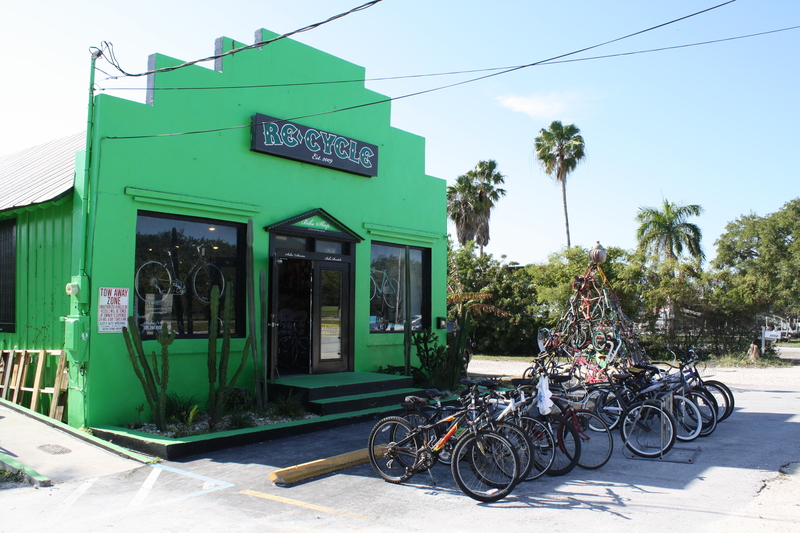 Don’t stop on the outside either, the shop is filled with BMX, touring, leisure & all other types of bicycles available to the Key West public. The employees themselves are young and enthusiastic about their sport and love talking about everything associated with the cycling trade. 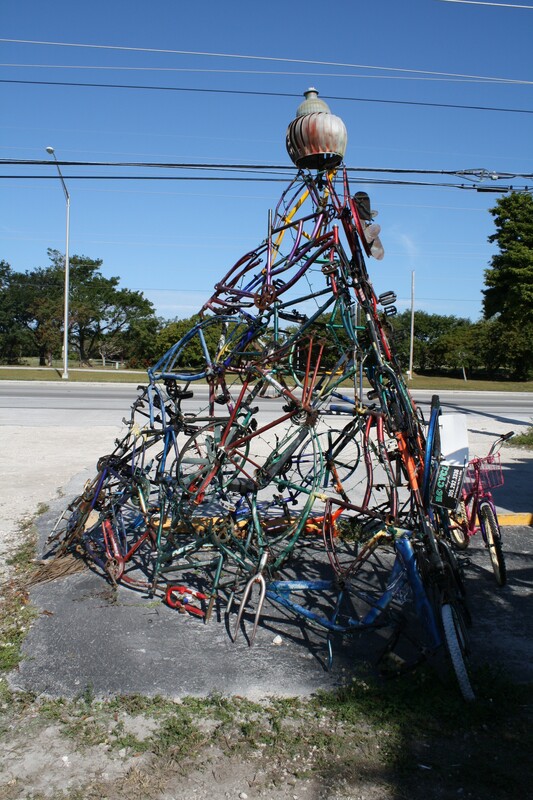 You can find this Key West pyramid of peddling perfection on US-1 bayside just before entering Key West on Stock Island next to the neon green building of the Re-Cycle Bike Shop. This is also ground zero and meeting spot for the outrageously dressed and weirdly decorated cycles of the Fantasy Fest Zombie Parade… but that’s another blog. 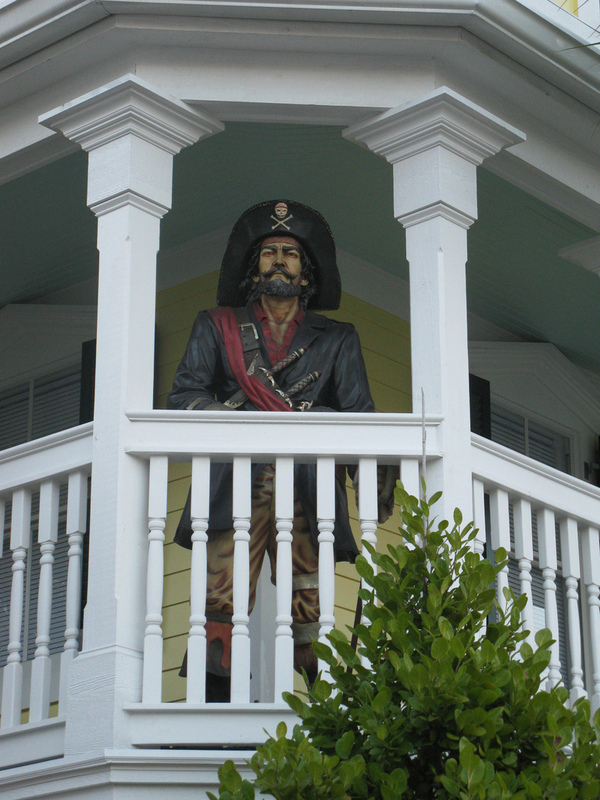 Key West has long been a haven for Caribbean Pirates ever since sailing the high seas has been around. 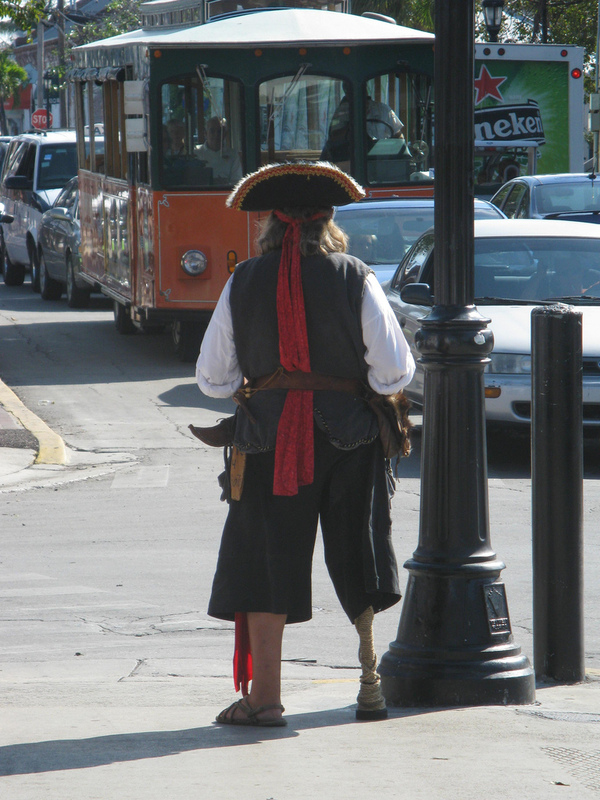 To date you can still find several of them perusing the streets in full regalia as seen to the left with a man who we’ll call “Captain Pegleg” for obvious reasons! 🙂 No this isn’t Halloween or any type of costume party, as most pirates, this is an opertunist awaiting an easy payday. This is one of many so-called street performers who will pose for your souvenir photo for a fee… ok, donation of a $1 or $2. As you can see in the photo above, he awaits his prey in the oncoming orange & black tour bus seen here. His prey, cash paying tourists, will soon depart their guided tour and begin cruising Duval Street… yes, that’s exactly the way he planned it! If you’re not so lucky as to find your own one-legged “Captain Pegleg” then I can help find you a more permanent one. Head on over to the corner of Caroline Street & Thomas Street where you’ll find one with a hangover. Ok, he’s just hanging over the balcony! 🙂 Once at the corner look up to the second floor balcony and you’ll see what looks like Captain Morgan’s brother or cousin. So stop on by and see either or both of Key West’s pirates for your trophy case framed souvenir photo! How Was Your Hometown Named? 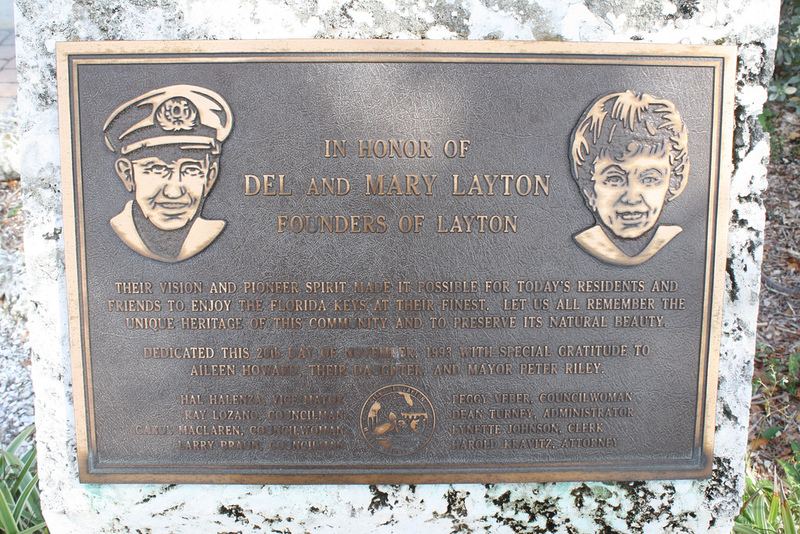 You can find this historical naming plaque at the Layton City Hall/Fire Department/Post Office/Laundromat/Petting Zoo 🙂 OK, I made up a few of those! Go to Mile Marker 68.3 oceanside on US-1 in the lovable Florida Keys. 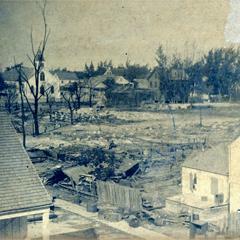 Exactly 133 years ago TODAY (+1 day) 🙂 a devastating fire ravaged Key West’s ‘Old Town’ and Duval Street! Sadly this was NO APRIL FOOLS JOKE. 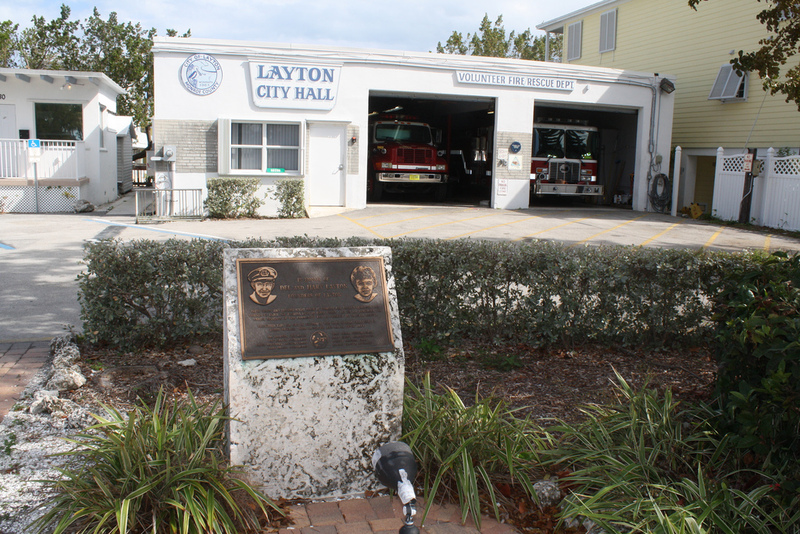 Here’s a Key West historical marker that I bet 10,000 people pass on a daily basis without ever knowing it’s there. 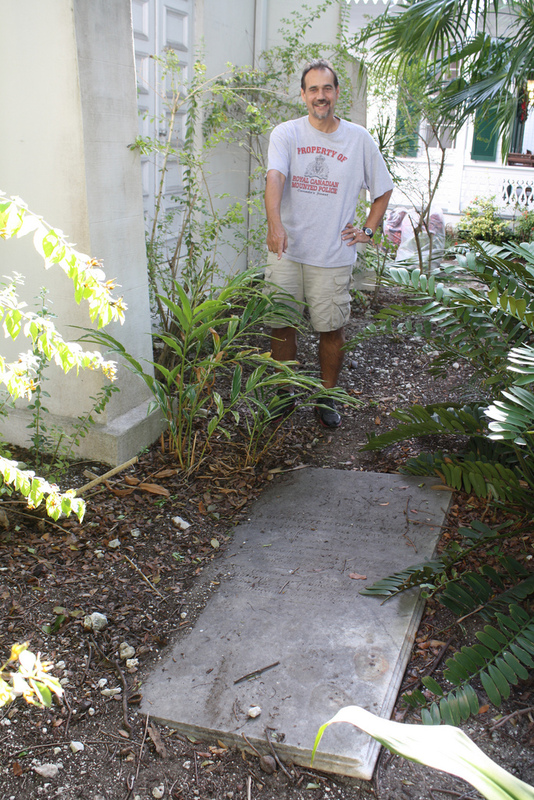 Yes, on Key West’s busiest street, Duval Street, this tiny 4″ wide x 10″ tall sign goes unnoticed by the masses. I’m determined to inform you my educated readers where it is and what it says so that you may seek it out on your next trip. 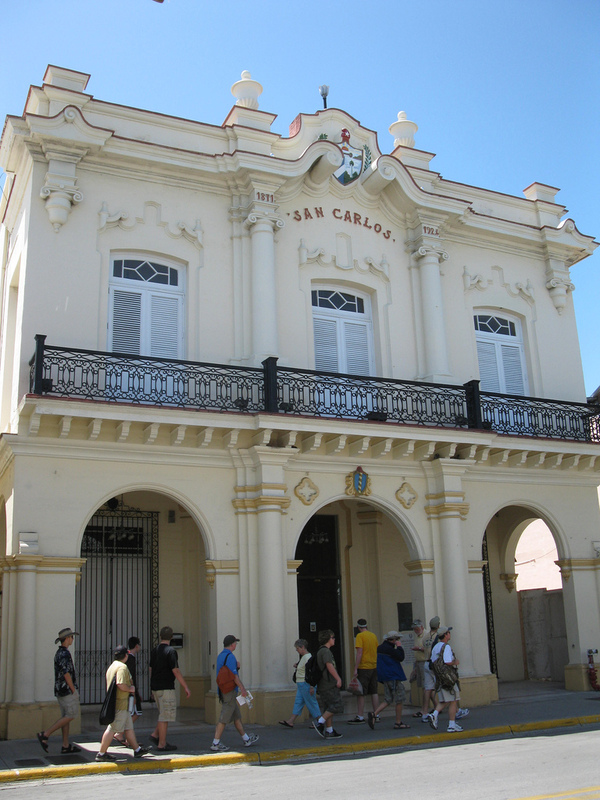 Key West’s most devastating fire was ignited in a coffee shop next to the San Carlos Institute at 2:00 a.m. April 1, 1886. 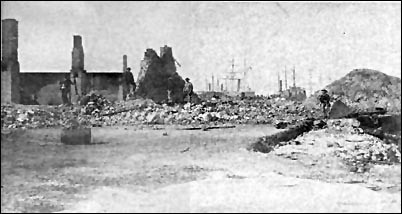 The fire raged for 12 hours as it raced through the center of the city, 16 cigar factories, 200 houses and several warehouses. Suspicions of murder, intrigue, and revolutionary aspirations swirl around its history. 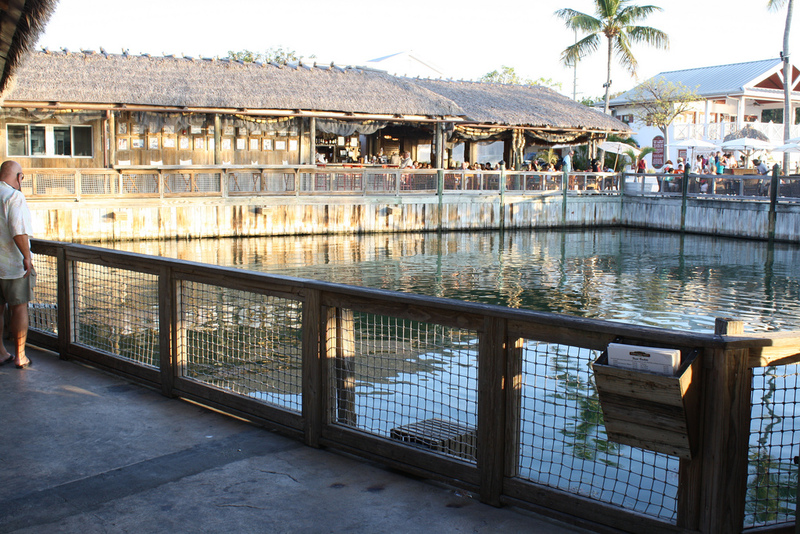 Since the fire, Key West has required all roofs to be made of metal to deter a future fire from spreading so quickly. I think they call that “A day late and a dollar short”! You can find this overlooked historic maker mounted on a wall at 516 Duval Street on the left side of the San Carlos Institute building pictured below. Happy April Fools’ Day! Though not a national holiday, April 1st (also known as All Fools’ Day) is widely recognized as a day when people play harmless practical jokes on each other. In Italy, Belgium, & France they call it April Fish Day taping a picture of a fish on an unsuspecting friend, fellow student, or co-worker! I kid you not, that’s 100% true! Its origin is uncertain to say the least, I’ve read at least a dozen different accounts of its possible beginnings. To be honest, you’ll just have to pick out the one you like best. One of the earliest recorded April Fools’ pranks was in Chaucer’s 1392 Canterbury Tales where readers misinterpretation of March 32nd as a valid date really being April 1st. Heck, I would’ve fallen for that one! 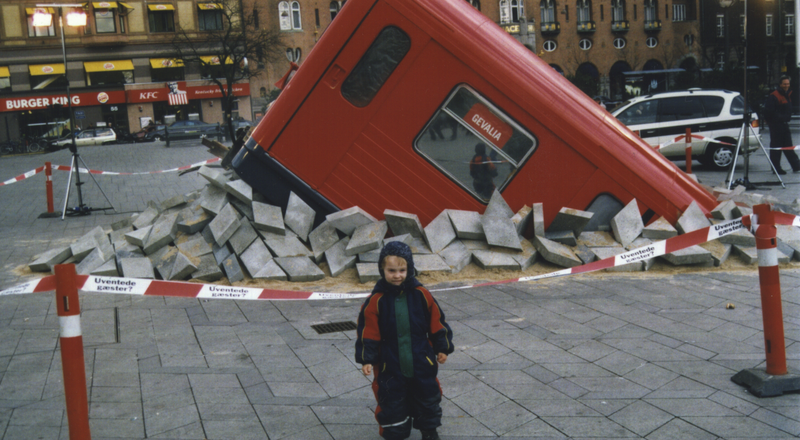 Pictured here is an April Fools’ joke in Copenhagen, Denmark a few years ago showing a subway car breaking thru the pavement. The best prank on me was at the Chicago International Airport having just touched down taxing past a banner reading “Welcome To Los Angeles”… way too cool!